﻿ Apollo™ - Total Oilfield Rentals Ltd. 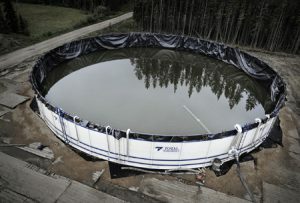 The APOLLOtm line of frac pools is a safe, reliable and economical storage system for large volume water storage needs. Our tank systems are easy to transport, fast to install, simple to use, and quick to dismantle. Engineered to be in compliance with AER Directive 55, the Apollotm is available in various sizes, as large as 6,350 m3 (40,000 bbl).